Back to dressmaking! 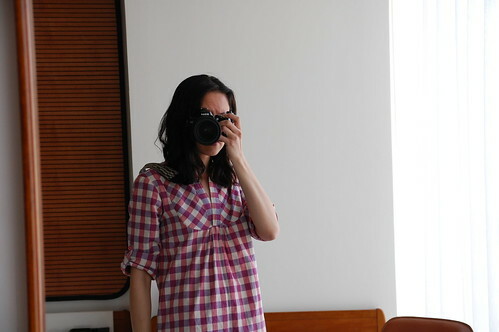 My latest and current favourite dress is this adorable bib front dress made with Japanese cotton/linen gingham. I made this dress for our trip to New York. I used Amy Butler’s Liverpool Shirt Dress as the starting point, but you’ll see that I made so many customizations that it’s really a completely new dress. Having done the Pattern Drafting class last summer, I felt pretty confident to play with drafting in my ideas for the perfect dress. I love dresses and tunics with yoke or bib fronts, so that was my first change. I cut the bib on the bias so that I could play with the gingham pattern. Then, I added in a little bit of gathering underneath the bib front. I also wanted to have sleeves that would roll up with a button tab, so I omitted the cuffs and made the sleeve straight. I already has those sweet little buttons in my collection, I’m pretty sure I got them at M&J Trimming in New York years ago. Now that I’ve started adding pockets, I’m completely hooked. It’s so fabulous (& easy) to have pockets, so I added pockets into the side seams. 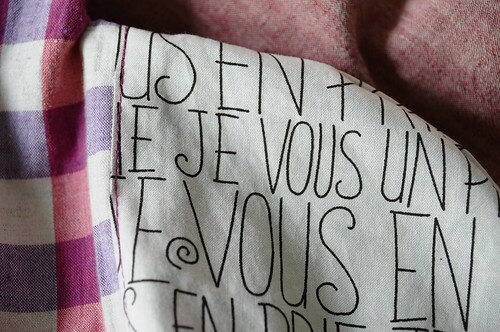 For the pockets, I used a french text print. I didn’t want a collar, so I just kept the collar stand. I really wasn’t too sure how it would turn out, but all my drafting went just as planned. The one thing I forgot to think about was how I was going to get into the dress. Halfway through making it, I realized that I had removed the button front of this pattern and if it was tight fitting, it might not slip over my head. In the end, it did slip over my head, but that was a good lesson about thinking things all the way through when you’re redrafting something. With the leftover fabric, I made a scarf for Andrew. I simply cut a piece that was 11″ x 60″. I sewed around the perimeter about 1/2″ in and then removed the loose threads along the edge to create a little bit of a fringe. There will definitely be another version (or two) of this dress. It’s so comfortable and easy to wear. I must say that I’m pretty proud of my skills on this one. wow. I love it. I am so determined to make some tunics and dresses for the summer. I have so much vintage fabric that it would be a shame not to. That is my perfect shirt, I have bought so many shirts just like that lately. Super cute! I love the neckline/collar. The shoulders are awesome too, perfect fit. Your dressmaking posts are always so helpful. Karyn, this shirt is awesome! I love it from top to bottom, back to front. Gorgeous! I love your modifications! Great job. The fabric is awesome too…where did you get it?? I think this just might be my favorite one so far! If there was a class for this dress, you can be sure I would be there! Great job Karyn! I love the details and that you cut the bib on the bias. It’s making me want to revisit some of the clothing projects I’ve started, but have been avoiding with the knowledge that many alterations will need to be made! wow, amazing job on your dress! i think it’s adorable. 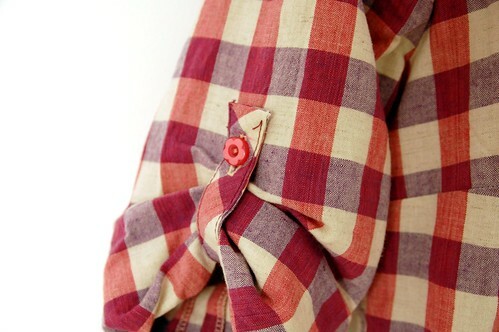 i just purchased some similar red/blue gingham with making a dress in mind. yours is definitely inspiration! This is SO great!!!! I love love love it! I love it so much! The biased check in the bib is brilliant. wow kyran! this is such a beautiful dress! i love the bib front, and the details of your dress. so perfect! you should teach a class on redrafting patterns in the future! I love this!! 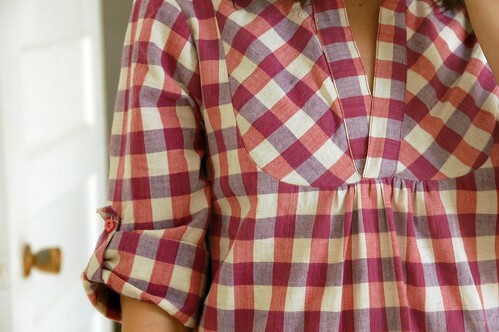 I just bought a large scale plaid like this and had been feeling a little worried that it wasn’t going to work. This gives me hope!! My favorite part, the roll up sleeves! I love that detail on store bought shirts. Absolutely fabulous Karyn! I’m thinking you should write out the pattern and sell it in the store – yes, that’s what I think! Wow! That’s great, I’m totally in love with your dress! you’re frightened of nothing with all these alterations… it was really worth it : it turned out gorgeous! i love that dress!!! i want one too. some day maybe. Love the dress, Karyn! Your dress shows off the two-tone gingham so nicely. I remember you showing a fabric tease snippet, and then the photo of you and Andrew in NYC. I thought recognized the fabric in his scarf and wondered if you had made it, too. ohh I love this dress! The print is so cute, defiantly one of my favourite dresses you’ve made! 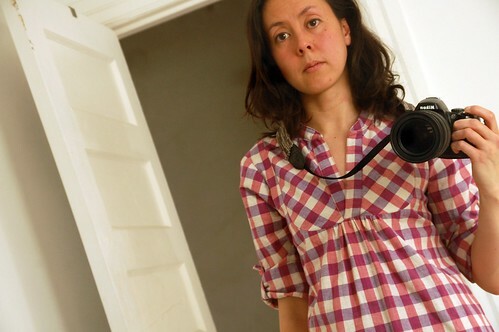 gretchen – there is actually a pattern in the Built by Wendy Dresses book that is basically the same as this with a bib front. If you like this style you should check out the book. I believe the dress is called ‘American Pastoral’. Love all the dresses and customization. Just wondering have you ever thought of sell those patterns? I would be glad to buy. Nice dress. Looks like the Tova pattern with a different shaped front insert.